Have you ever found anything of value between the covers of a used book? The only thing I have found is gum wrappers, movie ticket stubs and one time I found a feather. I have heard of notable finds that included a Mickey Mantle rookie baseball card and a golf scorecard signed by Don Drysdale and Sandy Koufax. Baseball and the Cold War_Howard Senzel. I had checked out the Echoing Green from the library some time but I really did not have time then and had to return it. I was glad that this book was among my finds. So currently I am reading The Echoing Green. This is not only a very good baseball book but a very good book. I know the ending but it is reading like a very good novel. I also found this book at another library sale. 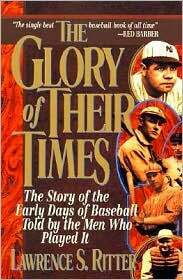 I have only read the story of Rube Marquard and Tommy Leach but so far this is another very good book. 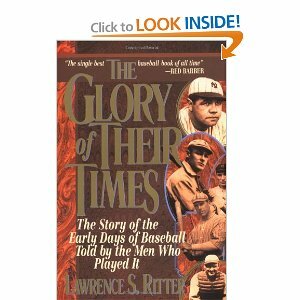 I am throughly enjoying the stories of these baseball players of yesterdays as told in their own humble words. 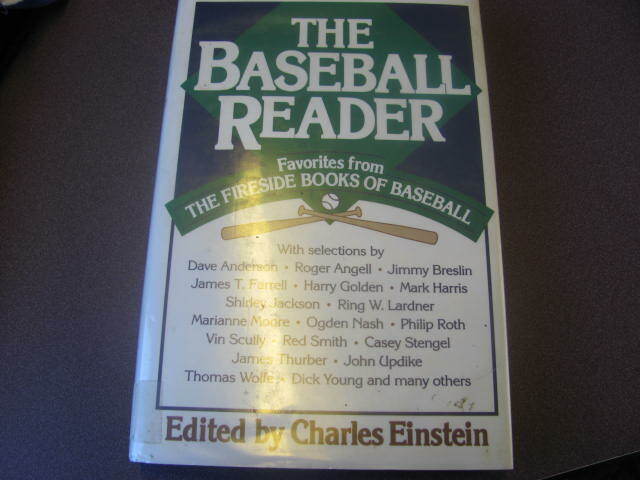 I recently went to the downtown LA library and found another treasure in “The Baseball Reader : Favorites from the Fireside Books of Baseball” Edited by Charles Eisntein. This book has articles by well-known sportwriters and a good selection of poetry and fiction. I want my own copy! The last article I read from this book is Roger Angell who is one of my favorites. It is foolish and childish, on the face of it, to affiliate ourselves with anything so insignificant and patently contrived and commercially exploitative as a professional sports team, and the amused superiority and icy scorn that the non-fan directs at the sports nut (I know this look–I know it by heart) is understandable and almost unanswerable. Almost. What is left out of this calculation, it seems to me, is the business of caring–caring deeply and passionately, really caring–which is a capacity or an emotion that has almost gone out of our lives. And so it seems possible that we have come to a time when it no longer matters so much what the caring is about, how frail or foolish is the object of that concern, as long as the feeling itself can be saved. Naïveté –the infantile and ignoble joy that sends a grown man or woman to dancing and shouting with joy in the middle of the night over the hazardous flight of a distant ball–seems a small price to pay for such a gift. Always such fun to discover literary treasures. Glad you’ve uncovered some good reading. And congrats on getting Ted Lilly. He should be a help to your rotation. Very active trading deadline this year! Congrats also on being a featured blogs on the MLBlogosphere! These are amazing finds! I thought I was a baseball fan, but I have not yet immersed myself in the literature that is obviously out there for us! I’m so excited to start reading some of these books in the off-season…it will be a long few months. Hope to have a knowledgeable conversation with you by next season, when the Dodgers will be on top again! I know sometimes I don’t have the time, but I want to read more! You never know what you will find between the covers of old books. Today I bought a 1968 cookbook and in there was a postcard from a Sheraton hotel in PA postmarked 1964. One book that I like for the offseason is “Wait till next year” by Doris Kearn Goodwin. It transports you back to the 50’s in Brooklyn when New York had three teams. I’ve never read a baseball book. Damnit I’ve never even seen a baseball book in my country. Can I ask? Do you have a recommendation of a book for a baseball novice like me, and I’ll hunt it down on Amazon or Ebay? LOL…I just pcked up 8 books at the thrift shop the other day. I love adding to my library! I’m most interested in the book Baseball and the Cold War! Looks like a good one. Doris Kearns Goodwin’s book is excellent. 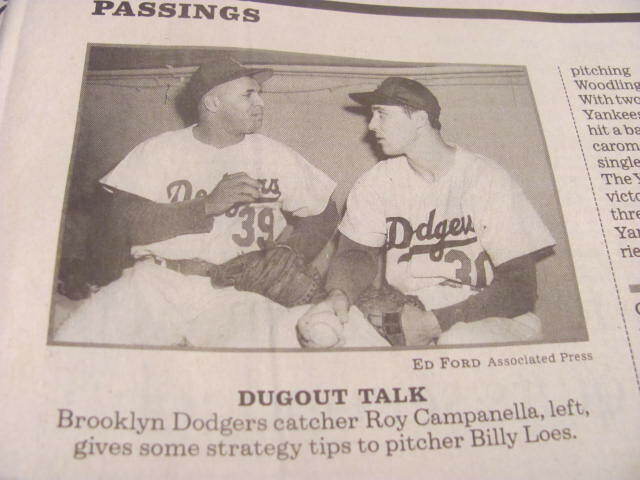 Rest Well Billy Loes; Brooklyn mourns. Hey Geoffh ~ just buy The Baseball Encyclopedia and you’ll lose yourself like you never thought before. Promise! ahh baseball books are so great! I love reading and I love baseball 😀 I haven’t read a baseball book in awhile though 😛 One of the best ones I ever read was about Buck O Neil, The Soul of Baseball. I even blogged about it way back when 😉 I also love finding things when cleaning or just uncovering the covers! In case it isn’t obvious by my screenname, I’ll admit off the bat that I’m a Giants fan. 🙂 But one thing we have in common is an appreciation for baseball and good sports literature. That excerpt you posted from “The Baseball Reader” is great; it really captures how I feel about the sport. It’s hard for me to articulate to people who aren’t fans why I’m so passionate about something that others see as “just a game”, and I can always appreciate reading other people’s explanations of why they care about it so much and why it’s important. Mike is an expert so I would go with his suggestion on a baseball book. I read your blog but can’t tell what team is your favorite. I believe the first baseball book I read was “the Boys of Summer” by Roger Kahn. 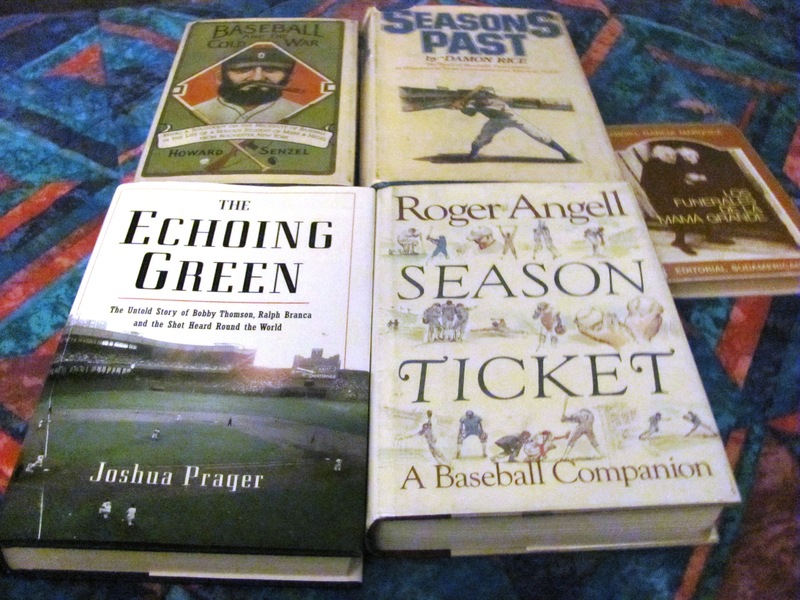 You can’t go wrong with a Roger Kahn or a Roger Angell book. I see you and I like to checkout the thrift stores for baseball books. Saturday they almost left inside a store. They forgot that I was in the back checking out books. I remember when your blog about Buck O Neil. He was a treasure! you have me curious about your post. Yep! I know you are a Giant Fan, but like you said, we have something common, the appreciation of baseball. I loved that quote from Roger Angell when I saw it in the book that I had to include it in my post. Like you, I felt that it captures how I feel about baseball. Awesome! Besides baseball, my other time-consuming passion is books! What a perfect union! Great entry…. I read some baseball books, haven’t read those, but i think i should get them from the library and check em out!!!! You are right! What a perfect union! Beisbol y libros! So you are going to Summer school? So many good baseball books so little time ha? I get to see your guy at Dodger Stadium! I hope for a good series. My boys just got to win sometime! You know, I’ve been to the library in San Diego. They have a good selection, especially of the old days in the minor league. yes, BIG series. Hard to believe that the Dodgers and Padres have only met for two games at Dodger Stadium. The short series was split and now my boys are on a losing streak but they got to win sometimes so the sooner the better. We’ll see how this plays out. Hello Emma, all baseball books here are so attractive! My favorite pastime in my college days was to hop in one of the secondhand bookstores around the campus and look for a reading treasure with interesting notes by the former owner. It’s so fun to imagine the character of the former owner of a secondhand book form handwritten notes or comments left on the pages. This is impossible for an electronic book, so I’ll continue to enjoy buying paper books unless they are too huge in volume or I have to understand the contents within a very limited time. that was so beautiful put! I can imagine you at those second hand bookstores. They almost locked me out in one those places because I was so engrossed checking the book in the far end. When the lights and air was turned off, I emerged with a book and they said “we did not know you were still here.”. It was funny. Leave it to the Dodgers.